20 to 50 years. The vines are mainly situated in the communes of Tournon and Sarras. Alcoholic fermentation in stainless steel tanks at high temperatures. Around 16 months in second wine oak barrels. Eye : Dark red with violet tints. Nose : Powerful nose dominated by red berries and delicate oak aromas. Palate : Powerful attack. Round and supple tannins. Overall : Eye : Dark red with violets tints. Nose : Powerful nose dominated by red berries and delicate oak aromas. Palate : Powerful attack. Round and supple tannins. This wine is produced from grapes from the two estates of Jean-Louis GRIPPAT and VALLOUIT as well from grapes and wines purchased in the trade. 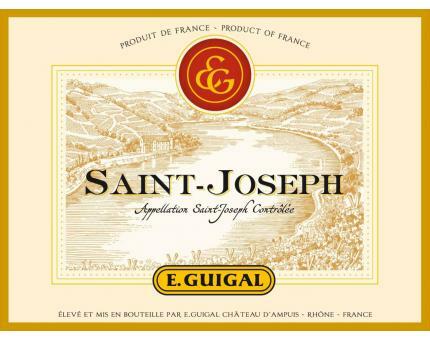 With an evolved dark plum/garnet color, blue and red fruits intermixed with herbs and earth and decent acidity, the 2008 St.-Joseph is a surprisingly strong effort in this mediocre vintage. Guigal told me that over 40% of the crop had to be eliminated because of unsatisfactory fruit. This is a wine to consume over the next 2-3 years. Drink: 2011 - 2014. Robert Parker.